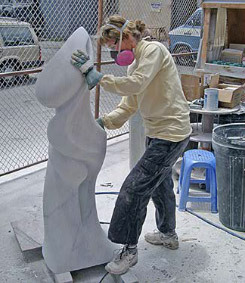 Dey Young began sculpting in 1977 at Scripps College in Claremont, California, learning her craft under the tutelage of renowned sculptor, Aldo Casanova. Dey continued to evolve gaining valuable experience from a number of teachers and artists throughout the US. Her vocational drive took her to Italy where she expanded her talents, working in Carrara marble with Italian artisans. Dey's understanding of anatomy is self-taught and she considers it a gift. In 2006, four of Dey's pieces were selected as Los Angeles County Museum's Special Projects and exhibited on the Art and Architecture Tour. This honor was again bestowed in 2012. Her work was also selected in 2011 by the National Sculpture Society to be featured online in their LOVE exhibition. Dey Young works in stone, terra cotta, bronze, cement and resin and has been enthusiastically received by many fine galleries including: Galerie Michael, Beverly Hills; The Earl McGrath Gallery, Los Angeles, Ca. ; Janine Contemporary, Santa Fe,NM; Alexander Salazar Fine Arts Galleries in both San Diego and La Jolla, Ca. ; the Mary Titus Gallery, Carmel, Ca. and most recently the James Gray Gallery and ArtLA at the Bergamot Station Arts Complex in Santa Monica, CA. Her sensuous forms have been described as "possessing an effortless sense of movement, embodying spirit and emotion and representing a nod to the past as well as an embrace of the future." Dey is an artist of immense passion and talent and is proud of her creative achievements represented in both the beauty of her sculpted pieces, as well as, her successes on stage and screen. Dey currently resides in Los Angeles, California. She is a proud member of the Art Museum Counsel at LACMA. Stone Journey - The Art Project, 21st Century Insurance Towers, Woodland Hills, Ca.